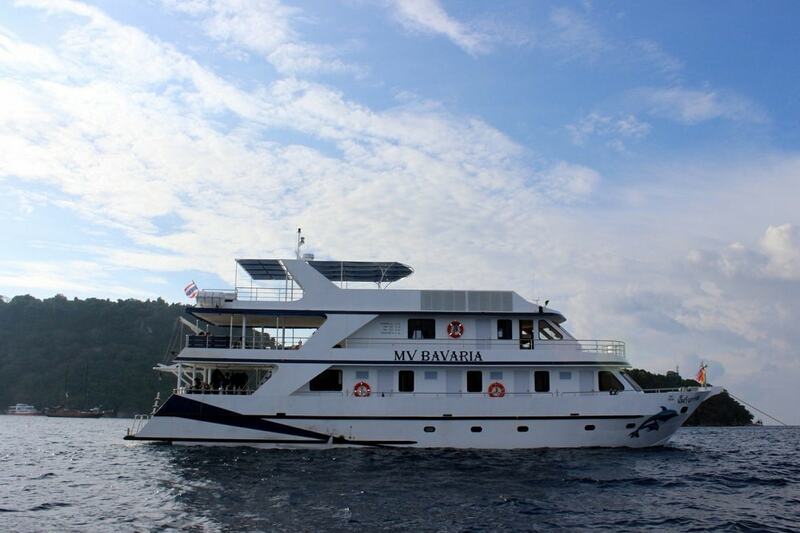 MV Bavaria is a Khao Lak liveaboard that was launched in December 2016. Since it’s launch Bavaria has done more diving in the Mergui archipegago than any other boat so it knows the dive sites very well. This German owned and run boat is popular with German speaking divers but also accommodates English speaking guests. Prices are good, especially if you want a private single cabin or have a non diving partner. These Burma cruises are not for beginner divers. You should be advanced certified with at least 50 logged dives and you should have dives logged within the last year. The itinerary includes Black Rock, Western Rocky and Shark Cave. 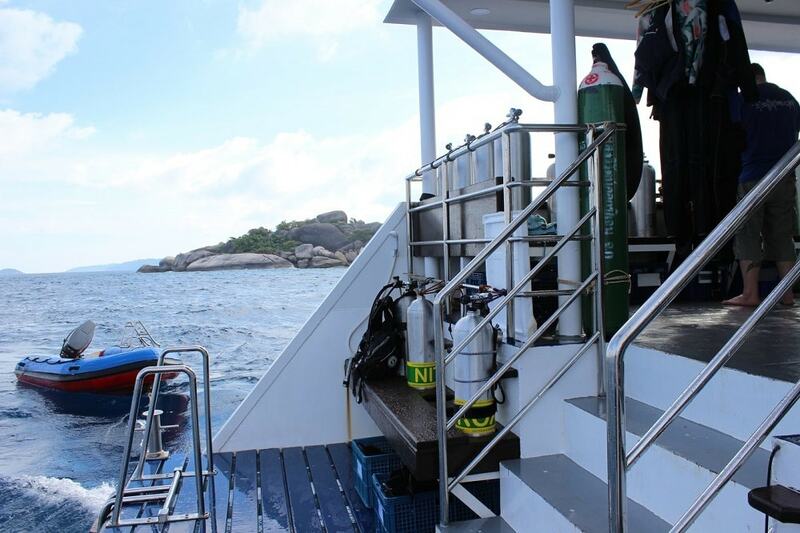 Bavaria also dives the Similan and Surin Islands so you can combine two trips for an epic Andaman sea safari. Lots of space. Large sun deck. PADI advanced courses available on board. Thai and European food. Served buffet style. 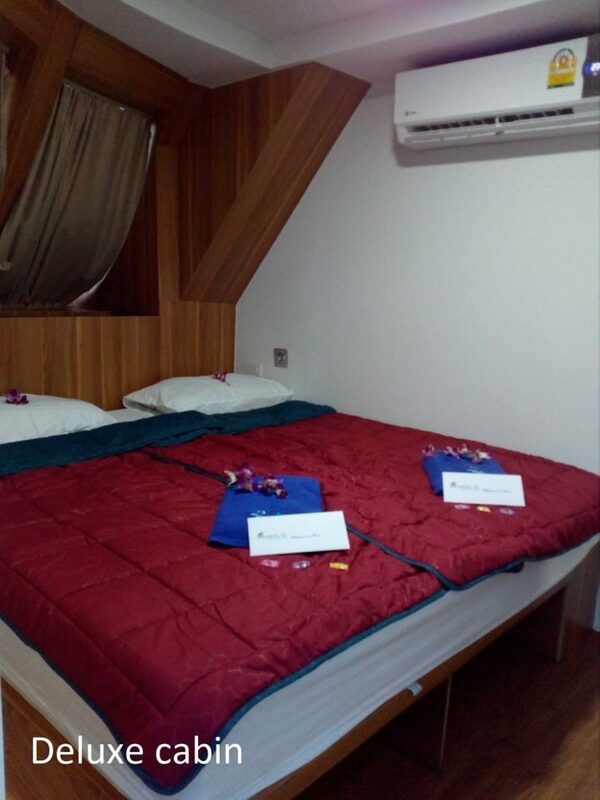 2 x deluxe double cabins with private en-suite bathroom forward on the main deck. EARLY BIRD OFFER: Book 6 months in advance for 5% discount. 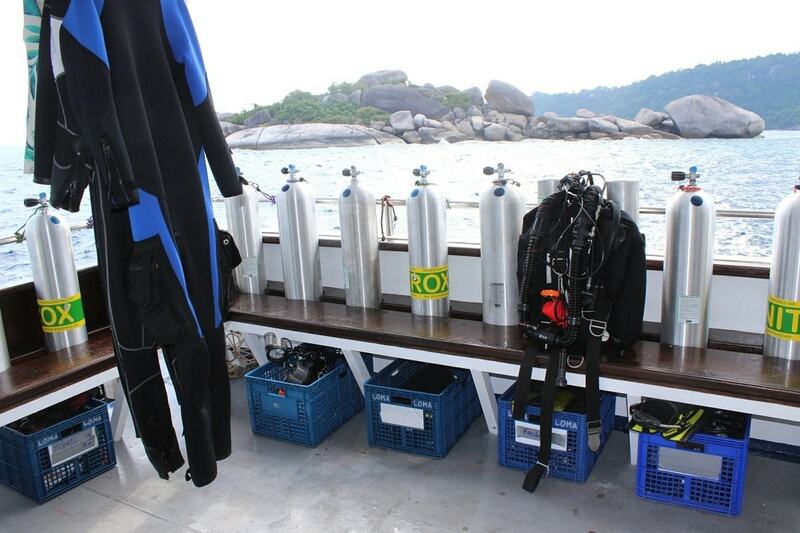 Price includes: Dive guide, 12 litre tanks, weights & belt, all meals, towels, round trip transfers from Khao hotels. 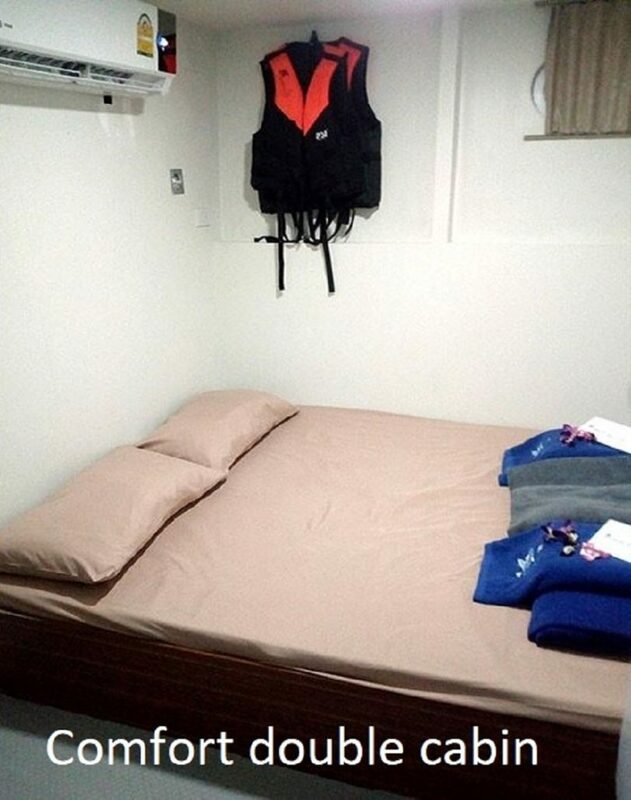 Price excludes: Equipment rental set (600 baht/day), dive computer (250 baht/day), marine national park fees, nitrox (200 baht/fill), 15 litre tanks, torches, alcoholic drinks, Phuket hotel transfers (available for an extra charge), Mergui entry fees (US$230), dive insurance (mandatory). Phuket to Khao Lak transfers can be arranged for 1,500-2,500 baht/way (depending on hotel location). 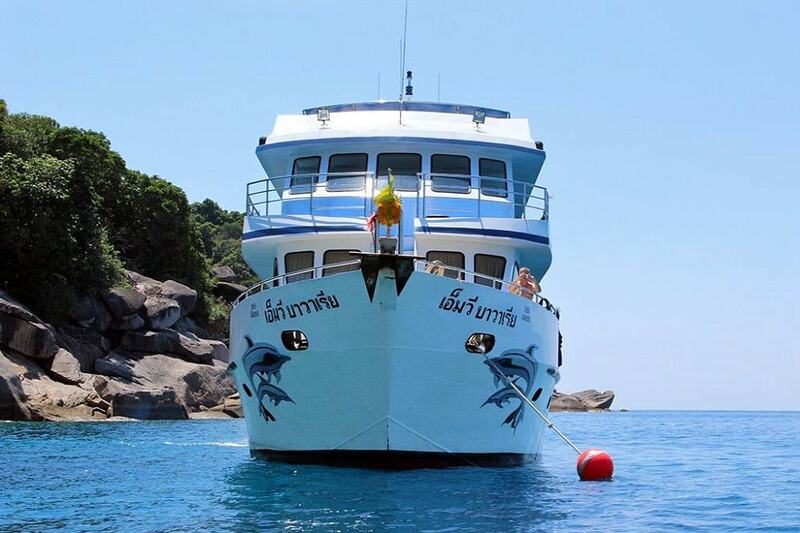 You must stay in Khao Lak on the night prior to this liveaboard. How to book this liveaboard: For advance bookings pay 10% deposit now to confirm your place, the balance is due 60 days before departure. Tell us the dates you want to book and we’ll email you booking instructions detailing inclusions, exclusions, payment schedule and methods. We accept major credit cards, paypal or bank transfer. We do not charge a fee for card payments. Day before: Meet at the Khao Lak dive shop (latest 18:00 hrs) to check paperwork and prepare equipment. Day 1: Pick up from your Khao Lak hotel at about 09:30 hrs for transfer by minibus to the harbour in Ranong. 13:00 hrs: Immigration procedures in Thailand, then cross to Kawthaung Myanmar. 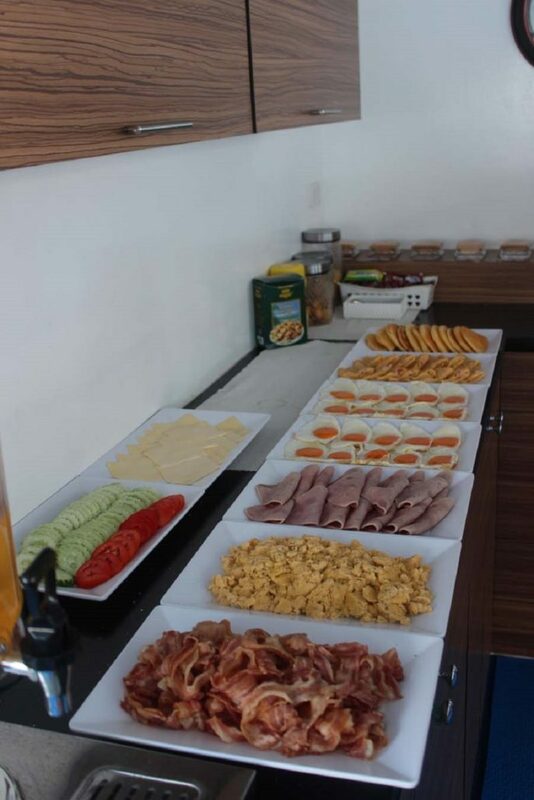 Lunch is served on board Bavaria. 14:00 hrs – 17:00 hrs: Immigration procedures in Myanmar. There is time to go on land and explore Kawthaung. Visit the temple and local market. 17:00 hrs: Cruise into the Mergui archipelago as sun sets. Dinner served on board. Day 2: First day diving. 4 dives at High Rock, Rocky 1 and Shark Cave. Day 3: 4 dives at Black Rock. Day 4: 3 dives around North Twin and a dive around South Twin. Day 5: 4 dives at The Arch, Boulder Rock and McLeod Island. Day 6: 2 dives at Fan Forest Pinnacle. 2 dives at Western Rocky. Day 7: 1 dive at Shark Point and 1 dive at Secret Lagoon. Return journey to Kawthaung in Myanmar. On arrival in this busy commercial town on the border to Thailand, there is some time to visit the local market. After completing the border formalities with the Burmese authorities Bavaria enters Thailand at Ranong where Thai immigration formalities are completed. Disembark then minibus transfer back to Khao Lak, arriving in the evening.